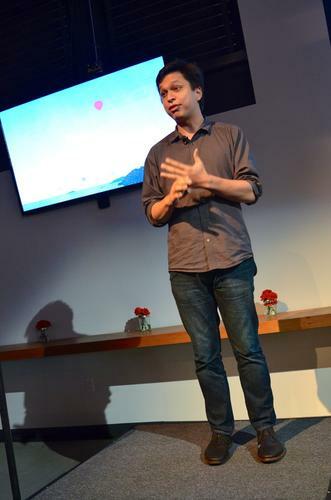 Pinterest CEO Ben Silbermann, pictured on Nov. 20, 2013, discussing the company's new mapping product. Pinterest is tweaking its service on the Web and mobile to make it easier for users to plan trips and locate their content with a new mapping product. On Wednesday the site announced "Place Pins," a tool that will allow users to see the location of businesses and other destinations and to get directions from one place to another. The tool will be coming as an update to Pinterest's apps on both iOS and Android-based devices -- and the Web -- on Wednesday evening, the company said. The tool is designed to make Pinterest more usable on the go, and add more location data to destinations or other places of interest accessible through the site. Over 75 percent of the site's traffic comes from mobile devices, Pinterest CEO Ben Silbermann reported Wednesday. The product was unveiled Wednesday evening at Pinterest's headquarters in San Francisco in front of an audience of Pinterest employees as well as end users and the press. Pinterest is a site that lets its users gather a range of outside content like photos of retail items, recipes, ideas for event planning or inspiring photographs. Users can "pin" this content from certain sites, which posts it to different sections of their profiles on Pinterest's site, known as "boards." With the new Place Pins, users can manually add location information to their existing pins through an integration with Foursquare, or add new pins with location information, as long as they come from partner sites like TripAdvisor, Trulia, Atlas Obscura and Jetsetter. So someone could look up a business on the new version of Pinterest's mobile app, and if the business is indexed by Foursquare, the person can pin it to his map, and get directions from his current location. Pinterest partnered with mapping developers MapBox and Stamen to design and customize the maps for users. Of the 1.5 million pins that are posted to Pinterest daily, roughly 750 million of them are related to things like vacations, local guides or businesses to check out, Silbermann said. The new tool is designed to make it easier for users to discover those places when they're out and about. Users can also share their pin-filled maps with others. That could be the case, as long as users opt to use Pinterest for location-oriented content, said Brian Blau, an industry analyst with Gartner. Not all of Pinterest's pins deal with location, he said, but the new service could work well for a certain class of pins. The new tool is probably not a Google Maps killer, he said, but it could become a convenient alternative to discovery apps like Yelp.